This book offers the ideal way for foreign lawyers, business executives, accountants, and professional advisors, to get a solid understanding of Dutch corporate law. This book represents a unique publication in the English language, and an indispensable tool for anybody who is involved in corporate matters in the Netherlands. Many international companies are Dutch holding companies. Therefore, the book addresses a wide audience. 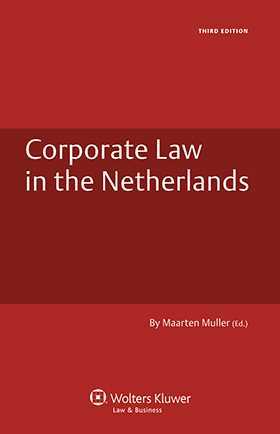 The book incorporates recent substantial changes in corporate law in the Netherlands. The authors are seasoned practitioners, experienced in representing international clients in the Dutch corporate arena. Together they also have extensive transactional experience. Corporate Law in the Netherlands will prove a practical and comprehensive guide for all foreign lawyers, businesses and individuals involved in corporate matters in the Netherlands, as well as a handy reference for Dutch lawyers who wish to advise their non-Dutch clients on Dutch corporate law. Chapter 2 Legal Business Forms. Chapter 3 Types and Formation of Companies. Chapter 4 Corporate Finance and Funding. Chapter 6 Corporate Bodies and their Resolutions. Chapter 8 Distribution of Powers; Management of Business Affairs. Chapter 9 Duties and Liabilities of Board Members. Offices of Allen & Overy.